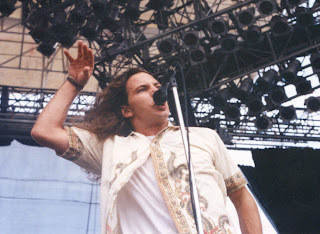 Photograph of Eddie Vedder of Pearl Jam, taken during the band's 50 minute set at Lollapalooza '92, on Saturday, September 5, 1992 at the Fort Bend County Fairgrounds in Rosenberg, Texas (just outside of Houston, Texas). It's difficult to imagine Eddie Vedder without at least some pretense. And break out in 1993 the band did, although in my memory, the band had already achieved a great level of success by September of 1992, at least for a new band. 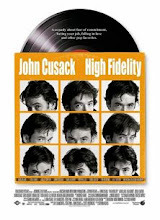 After all, Ten, its debut album, had been released over a year before in August of 1991 (although Wikipedia's entry on the album notes that it "took over a year to become a success."). I never understood why Pearl Jam was so closely associated with Nirvana and Soundgarden during the great grunge explosion of the early 1990s. Sure, Pearl Jam, like the other two bands, hailed from Seattle, but the musical similarities really end there. (To boot, Pearl Jam and Soundgarden did both tour as part of Lollapalooza '92.). However, Pearl Jam had more of a traditional and rootsier rock sound than the punk-influenced grunge of Kurt Cobain or Chris Cornell. That said, Ten was a marvelous record, and I listened to it ever so often in those days. I believe that I purchased the record shortly after hearing "Alive," but the slower, more melancholy "Black" became my favorite song from the album. Despite the fact that I've heard the songs so many times since then that they should be drained of any meaningful level of nostalgia, I still hearken back to the early 1990s whenever I happen to hear one of the album's tracks. Any excuse to hearken back to then is welcome. And, yes, the photograph above was indeed taken by me, using my photo pass. 1. Mason, Julie. "Traffic, parking costs, arrests part of Lollapalooza concert," Houston Chronicle, September 7, 1992. 2. Racine, Marty. " Lollapalooza!/The music is a decidedly hip, high-strung hybrid of rap, funk and hard, linear beats, laced with a requisite dose of attitude. 'Lots' of 'tude/New generation finds its alternative," Houston Chronicle, September 7, 1992. (emphasis added). I was in the front row during that set. Still to this day, 18 years later (jesus that's been a long time now) it is probably one of the highlights of my long-term memory. -I'd never have been able to go if we hadn't lived directly across the street-..best times!! I remember during Even Flow someone in the pit must've fallen because Ed made the band stop and had the audience help up the fallen fan. He said something like "I will be your lifeguard...3,4...Even Flow" and went into the chorus.